House raising is the process of elevating a home or extending the foundation. 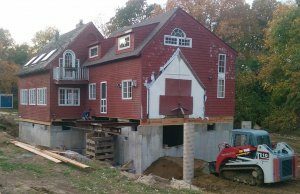 To raise a house, contractors separate the building from the foundation and use hydraulic jacks to extend the foundation. Given that it’s such an involved process, you have to be one hundred percent sure that raising a house is right for you. Some of the reasons that people choose to elevate their house is to avoid flooding danger, to add curb appeal and also for extra space. The main objective behind raising a house is to avoid a flood. If you live in a flood prone area, raising your home can protect it from extensive water damage. This is why you’re more likely to see elevated homes close to large bodies of water that have a tendency to flood. Likewise, if you live in an area prone to heavy storms, elevation is safer. Take pride in your home. Curb appeal not only ups the value of your property, but it’s something that you can be proud of. Elevated homes tend to be worth more money. While the act of house raising costs money, it can sometimes more than make up for it by adding value to your home. Who doesn’t need a little extra space? One of the bonus benefits of raising a home is that it often gives you extra space to use how you want. Normally, this adds up to about one full room. You can make this into a new office space or extra bedroom. For house raising, it is important to have a contractor with the specialized tools to handle the job. If you’re going to have the job done, it’s particularly important to make sure the job is done right. The benefits of house raising includes protection from flood danger, extra curb appeal and added space for your home.